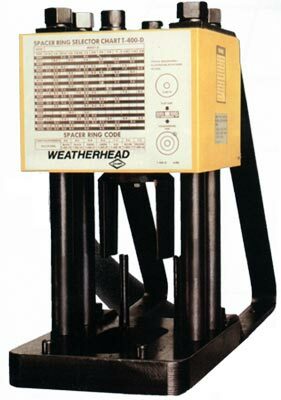 Weatherhead T-400 crimps from 3/16 to 1-1/4 inch one and two wire hydraulic hose. Crimp diameters are set for Weatherhead style fittings. Crimper includes five dies.The Coll-O-Crimp I is a versatile machine ideal for a shop, factory, construction or mine location. A time-proven 'Mini-Factory' that can easily set up in your own shop. Fast, easy, and compact make this crimper versatile for even the smallest of workshops. A quick and simple way to make factory quality hose assemblies. Now is your chance to have one for your facility. Or, you can start your own hose business. We can even supply the Weatherhead hose and fitting inventory for you to start your business - at discounted prices! This machine has been reconditioned, and all of the electrical, hydraulic and mechanical systems are in very good condition. We will include an Operators Manual with the equipment. 3/16" I.D. 1-fiber braid through 1-1/4" I.D. 2-wire hose. 'U' Series Collet - 1/4"
'U' Series Collet - 3/8"
'U' Series Collet - 1/2"
'U' Series Collet - 3/4"
'U' Series Collet - 1"